Just sharing this beautiful drawing made exclusively for my beloved daughter by my dear sister Joanna Felicia Read exactly a year ago, 30.12.2012. 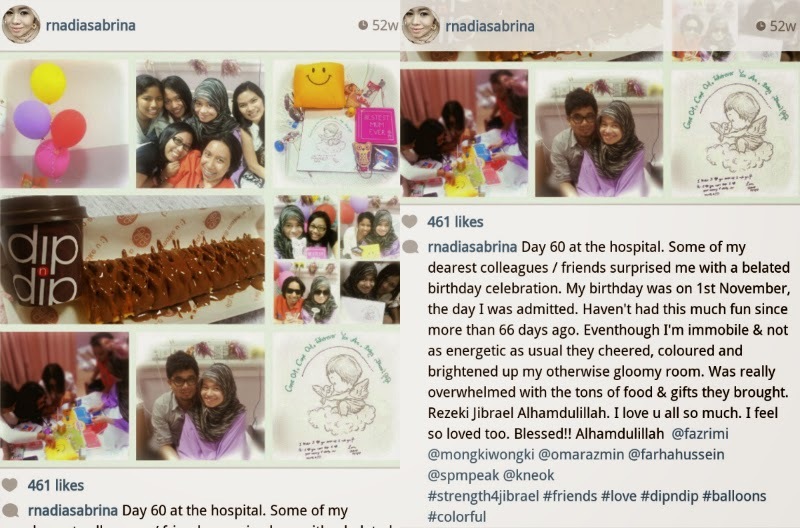 60 days after I was warded at the hospital. She drew this while I was lying down on my hospital bed being on strict bedrest carrying Jibrael :) Oh, I miss that feeling carrying Jibrael in my belly. I remember it was a beautiful day and many friends from the office came to keep me, my husband and Jibrael company that day. They brought so many food for us and cheered me up playing Cranium! I was flipping through the pages of the black book where family and friends who visited me, Jibrael and my husband at the hospital scribbled, drew and wrote wonderful things dedicated to Jibrael, me and Jibrael's father. I suddenly felt like taking a picture of this drawing just now and share it on my blog. Makes me happy to read all the things my dearest friends and family wrote inside all of the 5 black books filled with words and drawings. Touched my heart deeply to know that my daughter left a big mark in the lives of many through her brief visit in this world. Her visit in this world means the world to me. All praises to the Creator.